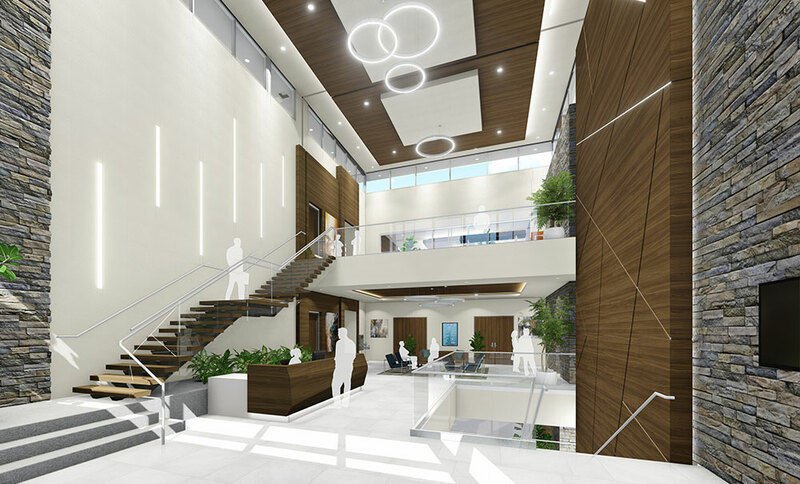 Curtis Miner Architecture (CMA) is currently designing a new 114,400 SF commercial office building for Alpha Warranty, a car insurance agency, as their headquarters offices. Located in South Jordan, Utah, this large building incorporates several diverse spaces, including a Lobby, open office spaces, high end executive suites, indoor/outdoor cafeteria, training rooms, basketball court, gym, locker rooms, game room, and bowling alley. The owners want to have a different feel than the minimalist/modern office buildings we’re seeing so often today; they wanted warm, natural elements in the building. To accomplish this, CMA has incorporated natural stone walls that continue from the exterior to the interior, combined with rich dark woods. Developing a color palette that reflects the company brand was very important. Alpha Warranty’s logo was the main source of color inspiration for the interiors. We also drew inspiration from the auto industry to reflect the clients’ business. The design team created a blend of spaces; exuberant pops of color were incorporated in certain areas, others reveal a mature, sophisticated style. 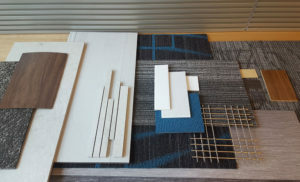 “There are many features within the building that relate to the automobile industry,” states Christina Perry, interior designer for the project, “they are subtle enough to give the building a modern feel rather than being too literal.” For instance, the carpet selected for the project abstractly reflects the patterns of tire treads. Wire mesh accent ceilings recall the metal on a car’s front grille, and custom accent lights for the hallways were designed by the team using repurposed car wheels.